In case you haven’t seen them, the winning images are all here. Of the 25 winning images which will make up the entire exhibit shown sometime within the next year, there’s only really one good one: Aztec Flying City by Bernard Bittler. 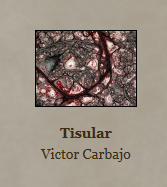 They messed up his name on the official website. I know because this image of Bernard’s and subsequently him as well is quite familiar to me; I reviewed it here on Orbit Trap over a year ago. He’s known as “arias” on Fractalforums.com where he posted the image in September of 2010. Even still, the image is an excellent example of state of the art 3D fractals and certainly not stale. I wouldn’t have reviewed any of the other 24 “winners” here on Orbit Trap because I don’t think they’d be of much interest to anyone. In fact, looking over all the entries left me feeling a little sorry for the judges. 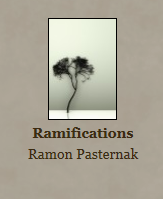 They can only chose from what is submitted and many of my favorite fractal artists, whose work like Bittler’s I’ve reviewed here: Johan Anderssen; Jeremie Brunet; Mark Brady; and Hal Tenny; submitted works which weren’t what I’d say were their best. Janet’s a legend in the fractal art world but as I posted just recently her work expresses a cheap sentimentality and cliche style that has come to characterize what’s dull and boring about fractal art these days. Even Louis Markoya, a winner in the contest, agreed with my comparison of her with Thomas Kinkade, that great “Painter of Kitsch”. 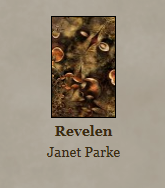 “Revelen” or any of her other works with such pompous titles belong with the also-rans and not with the winners. This one wouldn’t even make it into the deceased Fractal Universe Calendar. 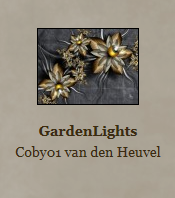 Shiny flowers arranged on a string over a textured background layer? It’s almost childish. There’s a mistake with the name, maybe there’s also a mistake in placing this one as a winner? 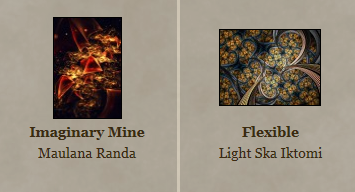 Conveniently placed together for a screen-shot, here’s two more “winners” who ought to have shared a common destiny buried away in a Deviant Art gallery. You can’t see much from these thumbnails but take it from me, they look even more trivial when viewed large scale on the contest site. More cliche fractal “art”. Yvonne Mous is a previous BMFAC winner. I don’t think that’s much of a compliment anymore. Jessica ought to be ashamed for trying to connect her multi-colored spiral party with Vincent Van Gogh’s art work. Of course she’s not guilty of elevating it to the winner’s circle. All she did was submit it. You are forgiven. Go and sin no more! One other thing: isn’t that the “garish, 70s-style imagery” that the Rules say they don’t want to exhibit? Carbajo is another artist who was chosen in a previous BMFAC. While the other “losers” are merely decorative, this one is merely disgusting. Yes, it looks like a tissue slide. But why would we want to look at it? Or exhibit it? I first saw this one just a few days ago in the recent gallery uploads page on Fractalforums.com. 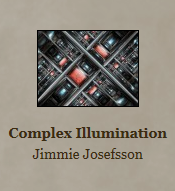 I didn’t click on it there but I did click on it when I saw it on the winners page of the BMFAC 2011 site. Another shiny thing from Ultra Fractal. Even Janet doesn’t make shiny stuff anymore. The Fractal Universe Calendar would have made this a cover image. Bill is a veteran BMFAC winner. He’s tied with Dave Makin for the lifetime achievement award. Dave was a judge so he couldn’t enter the contest this year. If they want to be fair about things they should make Bill a judge next time so Dave won’t be penalized for his pit stop as a judge this year. 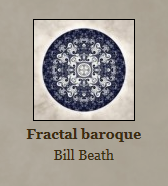 Bill’s work is sharply rendered and very fractal but so is a broken window. Come on. What were they thinking when they chose this DESKTOP WALLPAPER as one of 25 images for an art exhibition? I will acquiesce and say that maybe Janet Parke’s artwork is a matter of taste and I just don’t care for it, but this glassy tree on a mirrored surface by Pasternak looks like a User Contributed Aero desktop theme for Windows Vista. They’re going to print this out the size of a door and hang it on a wall? It’s nothing more than a cellphone background. Ewa’s another long time competitor in this World Cup of Fractal Art. 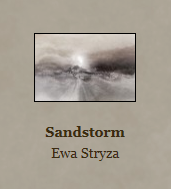 I was a little hesitant to label it as one of the losers because I looked so long into that fuzzy sandstorm expecting to see something. Ewa’s learned a thing or two about “artistic” fractals. Make them fuzzy and highly textured and people will see things in them. It would be interesting to hear what the judges saw in this one. I’ll bet it would be more interesting than the actual artwork. Let me end off on a positive note. One of our “biggest fans” here on Orbit Trap has been hard done by in this year’s contest. I’ve listed here 11 images that I think are worthless examples of fractal art out of the total of 25 that they chose as the winners. That’s almost half the winning entries. Those images have taken places that other entries could have filled. Think about that. 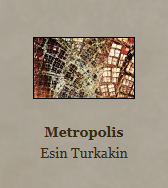 Decide for yourselves: Isn’t Esin’s Metropolis better than all these losers? And yet, it won’t be exhibited because the judges thought those 11 were better than this one. I can’t blame the judges for not picking works that weren’t submitted, but I can accuse them of incompetence when they chose bad ones over better ones. I’m not saying it’s great, I’m just saying it’s better. 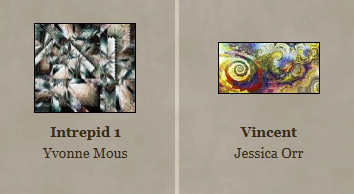 The Benoit Mandelbrot Fractal Art Contest needs a better system of judging. Better art submissions won’t matter until they fix a system that is both dysfunctional as well as shrouded in secrecy. This year’s herd of losers really begs that point. Oh, and give Bill a chance, too. With respect to the 3D, the quality of entries overall was admittedly very poor compared to what’s out there and I have to say the one you claim to be “better” than the winners is so bog-standard/run-of-the-mill compared to the best Mandelbulber and Mandelbulb3D work that I’m surprised you have the nerve to make such a claim – try looking through *all* the 3D work at fractalforums and DA first in future and you’ll see about 50 novices producing better results in about 3 days of playing with the software. Also personally I do *not* like Aztec Flying City – neither fractal in the composition is particularly interesting or particularly well lit or rendered in fact both look like the artist found the first framed view of *default settings* for a given formula that looked half-decent and didn’t bother trying to light or colour them to best advantage. All your other complaints are simply a matter of taste and at least in two other cases I also was disappointed that the images were chosen but the panel consisted of others and they obviously did not agree – in fact several of the images you do not like were liked by Aliette Mandelbrot and Michael Barnsley who, though not judges, did express their own choices from the short-list after the initial scoring. With respect to “shrouded in mystery” – there is no obligation for any judging panel to give full details of their methods in any contest I have ever taken part in from showing rabbits to programming. If you must know: first all judges ranked all images, then after this stage the scores were totaled up and ranked in order to give a short list – of course at this stage the top 25 was not finished as it included a number of images by the same artist in several cases plus a number of tied scores etc. and in any case the onus on the contest is to make the winners representative of as wide a cross-section of the genre as possible. Hence there was some discussion as to which images would actually be the winners. In actual fact apart from choosing a specific image from each artist with more than one ranking highly there was very little adjustment of the initial order based purely on rank totals. Dave, thanks so much for shedding some light on how the judging is actually done. Neither Damien nor any other judge has ever done this either on the official site, a forum or here. I’ve always been suspicious of the judging process simply because no one involved would ever talk about it. Why keep it a secret and ignore questions about it (for years) if there’s nothing deceptive going on? I still think they ought to make some changes. Maybe reduce the number of judges or chose ones with more of an art background. And limiting artists to only one winning entry doesn’t make for a better exhibition. The logic behind these unwritten rules needs to be reconsidered, I think. Or is it a person?